I get a lot of questions and requests that are, taken together, very time consuming. The 13 answers listed below are concise and correspond to the most frequently asked questions. If there is anything which is not dealt with here, you can always e-mail me at contato@marcosbeccari.com. 1. Is it possible to buy your artwork? Do you work with orders, commissions or illustration jobs? Sorry, but I can NOT sell my paintings, because the university where I work does not allow me to have a second source of income. I am only a teacher and I do NOT intend to make money with my paintings. 2. Why do you paint? Because I like to paint. There is no other reason. 3. Are your paintings exposed somewhere? No, I collect my own paintings and gift some of them. I don’t sell prints also. 4. Do you have online courses, books or anything? No, I teach only at UFPR (Brazil) and eventually at occasional workshops in São Paulo. I am comfortable in this situation and I do not intend to expand my classes. 5. 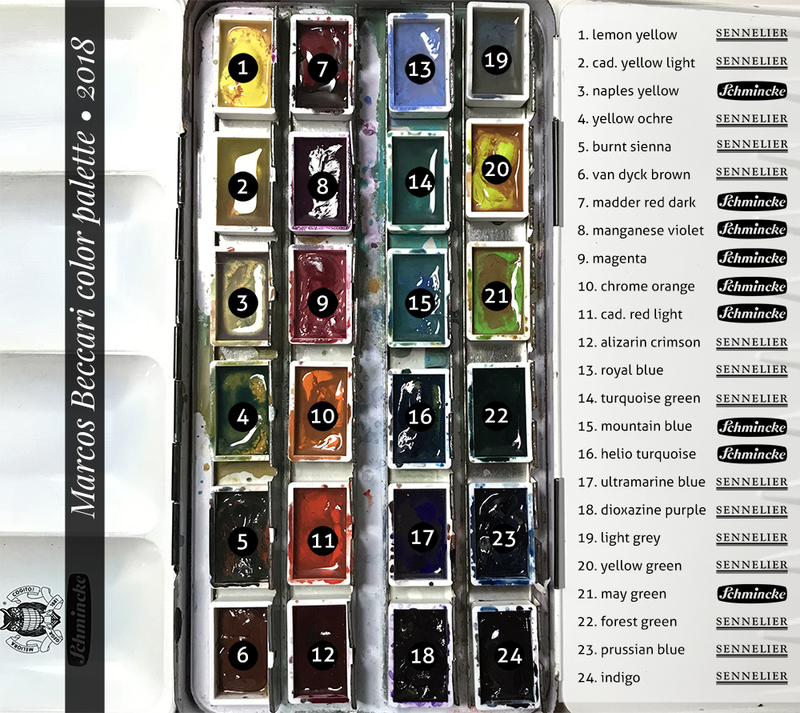 What watercolor brands do you use? 6. What colors do you use? 7. What is the size of your paintings? And how long it takes for each painting? Currently I work in the formats 56×76 cm and 38×56 cm. I spend between 4 to 6 hours. 8. Do you use photo references to paint? Yes, I gather photo references for the majority of my paintings – photos taken by myself or found on stock resources such as the Pinterest (being careful about copyright). But rather than copy it directly, I seek to translate the lights and colors into a clear and concise composition. I never appreciated “photorealism”, only the pictorial realism. 9. What subjects do you prefer to paint and why? The human figure in general, I don’t know why. The pictures which most often inspire me are from movies, which usually give me ideas for a drawing and motivate the painting process. And lately I’ve focused on the body submerged in water, simply because it is a beautiful situation. 10. Who are your main reference artists? Johannes Vermeer, Anders Zorn, John S. Sargent, Joaquín Sorolla, Walter Everett, Edward Hopper, Saul Leiter (photographer), Stanislaw Zoladz, Jeremy Mann, Stephen Scott Young and Mary White. 11. Do I need to ask permission to share your paintings on blogs, websites, social networks, etc.? There is no need to ask permission beforehand, and I am very grateful to anyone who wants to share my paintings (please post my images with a link back to my Instagram). However, please do not demand that I share the link on my social networks, this is very annoying. 12. Could you do a sponsored post? How to licensing your artwork for commercial use? I do not accept any requests to promote projects, artists or products of any kind on my social networks. I am not open to using my social networks as an advertising space, paid or otherwise, and I am not interested in any kind of commercial trading. 13. Can you give me an opinion about my artwork, a mentoring or just some tips? Teaching is my ONLY source of income, so I don’t give any advice free of cost.